Sugarlands Distilling makes all kinds of flavored moonshine out of their home in Gatlinburg, Tennessee, including this classic slice of Southern hospitality, Appalachian Apple Pie. It’s 50 proof, so it’s not going to make you go blind, and the addition of green apple and lemon zest keep things interesting. 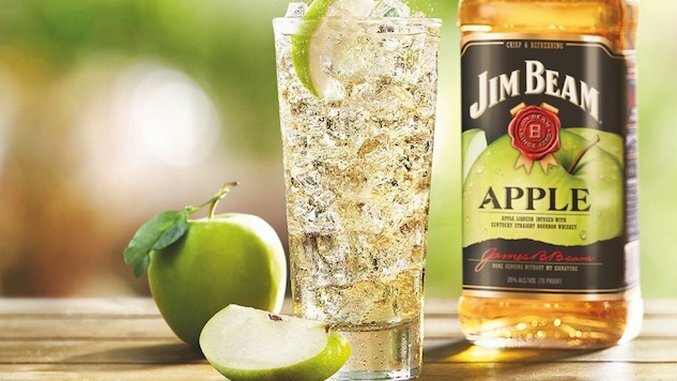 Jim Beam wants you to mix this flavored bourbon with club soda and a wedge of lemon. I could also see putting a couple ounces in a good ginger ale, too. If you’ve ever had Leopold Brothers Rye, you know that the distillery pays attention to the details, and their line of flavored whiskey is no exception. This 80-proof whiskey is a work of art. The apples are juiced and blended with the whiskey, then aged in American oak barrels to pick up all kinds of dark fruit notes. If you’re looking for high-brow flavored whiskey, this is it. Wigle makes certified organic whiskey in Pennsylvania, from style-centric bourbons and ryes to this off-center apple whiskey, which uses local cider for a whiskey that balances the sweet with the tart. Crown Royal is a master of blending whiskies, and they work their magic in this bottle by combining Gala apples with their soft and sweet Canadian whiskey. Mix a shot of Regal Apple with some cinnamon for a “Bad Apple” shot. Name a flavor, and Bird Dog has a whiskey representation of that flavor. Blackberry, peach, hot cinnamon, even chocolate. And yeah, this 80-proof apple flavored version is probably the best of the bunch. Take a carefully crafted corn whiskey, add some cider from New York along with cinnamon, vanilla and brown sugar and you get this 70-proof moonshine that has a slew of awards to its name. Try the “Tijuana Rattler,” which combines tequila, Rosie’s, lemon juice and ginger beer. Looking for something a little bit different to add a seasonally appropriate kick to your standard cocktails? Search no further than apple-flavored whiskey. Now, I know there are purists who believe flavored whiskey of any kind is sacrilegious, and I understand their point of view. Rye, bourbon, even well-made but un-aged whiskey is so good, why bother with any adjunct flavoring at all? You could certainly make that argument. But there’s a time and place for everything, and right now, apple whiskey is having a moment as certain brands are taking an elevated approach to what could be a gimmicky booze. And don’t forget, moonshiners have been leaning heavily on apples for their apple-pie moonshine for decades, if not centuries. So we found seven whiskies that Johnny Appleseed would approve of for your fall cocktails.